Out with the old and in with the new, right? That’s how the saying goes and there are always updates to be done in the home! Your home theater is no exception! Here are 5 ways to update your media room or home theater. Soften reflective surfaces. Your speakers may be producing great sound, but flat, hard surfaces of ceilings, hardwood floors, windows and walls reflect that sound back to you. You hear this distorted noise, rather than clean sound from your speakers. Carpeting and curtains can reduce this effect to leave you enthralled in the cinema! 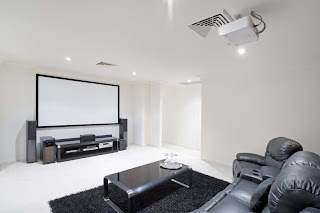 Consider acoustic panels to soundproof your home theater and reduce ambient echo. These acoustic panels come in a variety of styles and ensure a clean and clear audio experience. A high quality subwoofer can give your home theater an upscale experience. Most television setups at home don’t have a subwoofer. It is a unique addition that will instantly upgrade your media room. A subwoofer gives a tactile-like response to sound. Consult a specialist if you are unsure of what size subwoofer to purchase. As a rule of thumb, choose higher quality over size! Love the feeling a great subwoofer gives? Take it one step further with SoundShaker! SoundShaker allows you to feel the screen action from your seat. Not only will you see and hear the film, but you will live in the moment as your chair vibrates in coordination to explosions, car chases and more! The SoundShaker Amp connects to most major audio receivers, so no need to completely revamp what you already have. The Amp then sends a signal to the Transducer, which is attached to your seat and vibrates in synchronization with on-screen action. SoundShaker provides a look into a new dimension of cinema. Seating can make or break your home theater. Comfortable, high quality seating will instantly upgrade your media room. Seatcraft offers home theater seating at a number of price points for all budgets. The Seatcraft Sienna, as well as other models, feature wall-hugger seating. This allows the chair to sit mere inches from the wall, even when fully reclined! Wall-hugger chairs are a great option for an efficient use of space. Other seats, like the Seatcraft Seville, offer a lighted base and cup holders, power recline and grade 7000 leather. Add accessories to make your seats your own. A swivel tray is perfect place for your popcorn or laptop. A wine caddy or lighted cupholder will keep your drink from spilling. If you can’t find a seat that suits you, Seatcraft gives you the option to build your own! Pick your material (fabric, bonded leather, leather 5000 or leather 7000) and color (black, brown, grey, red and more!). Then, choose if you want a straight or curved row. Lastly, decide between power and manual recline. Ready to kick your lounging into high gear? Consider the Seatcraft Cuddle Seat. Remember that not all updates need to be large-scale. Making small changes can make a big difference in the long run. Little details add up! Add a popcorn machine for easy access to mid-movie snacks. Interested in something sweeter? Swap popcorn for cotton candy. Wall accents not only provide extra soundproofing but they also add an extra decorative touch. Don’t let the idea of upgrading your home theater be intimidating. It’s all in the details! Decide on your main priorities and then work down the list from there. Need more ideas? Check out our Pinterest page for themes and designs to spark some ideas.